Executive Mosaic is pleased to announce Steve Schorer, president and chief executive officer of Alion Science and Technology, has been selected as an inductee into the 2018 edition of the Wash100 — Executive Mosaic’s annual selection of the most influential voices in the government contracting arena — for his over three decades of leadership in the aerospace, aviation, defense and government services markets. During his time at the helm, Schorer has overseen major contract wins for McLean, Va.-based Alion including: a 58-month, potential $40.9 million contract awarded by the U.S. Air Force in December, to address life-limiting issues on its C-130, C-5, C-17 and F-15 aircraft fleets, which covers requirements evaluation, planning, logistics, engineering, testing, prototyping and data management support; and a five-year, potential $41.4 million contract last September from the Space and Naval Warfare Systems Center Pacific, being one of four companies tasked with implementing and installing command, control, communications, computers, intelligence, surveillance and reconnaissance training platforms. Prior to joining Alion, Schorer served as president of DynAviation from 2015-2016 and president of DynCorp from 2011-2013, having first joined the company in 2009 to serve as president of its global platform support solutions business unit. He was also president of the C4I division of DRS Technologies (which now operates as Leonardo DRS) from 2003-2008; and president and general manager of L-3 Communications’ Ocean Systems Division from 1998-2003. While at DynCorp, Schorer supported important federal clients such as the Department of Defense and the State Department, oversaw the sale of DynCorp to Cerberus Capital, and helped grow the Falls Church, Va. company from $3 billion in revenue to more than $4.1 billion. 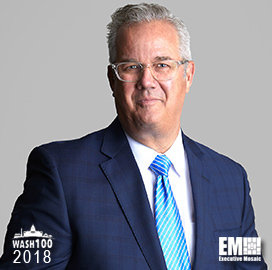 Alion has been listed as “Top 50 Technology Employers” for the D.C. metro area by the Washington Business Journal and voted a “Best for Vets Employer” by the Military Times Edge. Executive Mosaic congratulates Steve Schorer and the Alion team for receiving this award.